I’m just going to go out and say it, you guys, I hate the word meatball. It’s just not very cute, you know? Like MEATBALL?! Hmm, it’s so odd to me and just well, so unattractive, but I guess that’s what you call a ball of meat. Makes sense, I get it, but still, it’s just not my favorite word, especially when there are 171,476 in the English language, I mean that’s the best we could come up with? For the longest time I really steered clear of meatballs. They never excited me and I didn’t grow up eating them, so they just weren’t something I thought I needed to make. However, in an effort to keep things fresh and new here on HBH, I try to branch out of my comfort zone and try new to me foods. Over the years I’ve slowly grown to like (some) meatballs. 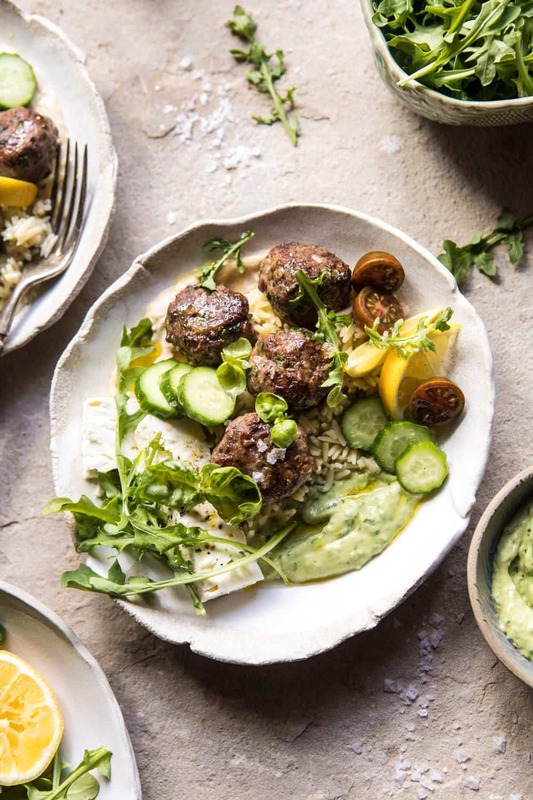 I’ve now made a few versions (see here, here, and also in my cookbook), but these Greek inspired lamb meatballs are so different and so delicious. Hands down these are my favorite meatball I’ve made. PS. how many times to you think I say meatball throughout this post? YIKES. 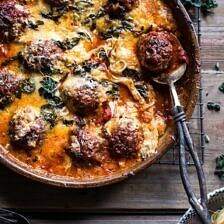 Unlike an Italian meatball, this Greek version is made a little simpler, and a littler healthier. I use plenty of fresh herbs, lean ground lamb, and lots of lemon (because apparently I am lemon obsessed). These are quick and easy to throw together and if you’re turned off by the idea of using lamb, you really shouldn’t be! It’s a great alternative to beef and in my opinion, has so much more flavor. That said, any ground meat can be used in place of the lamb, but I recommend meat that has a little fat on it. I paired my Greek meatballs with some orzo, goddess sauce, and plenty of feta cheese. Oh, and greens too, of course. Whenever I make meatballs, I always, always roast them in the oven as opposed to pan frying them. I’m pretty sure none of us wants to stand at the stove and tend to meatballs for thirty minutes. No, that is just not fun. I’ve also found that roasted meatballs just taste better. They hold their shape and never turn out dry. 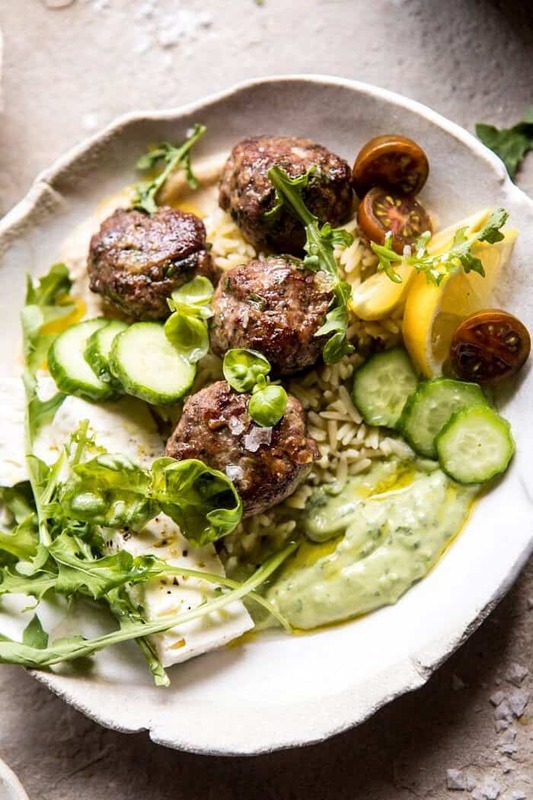 Traditionally, Greek meatballs are served in or on a pita, but I was really feeling like this was a bowl kind of meal, so I decided to spread my goddess sauce (and some hummus too) inside a low bowl and pile it high with orzo, feta cheese, and plenty of greens. Speaking of that goddess sauce. Oh my gosh. It. Is. Good. Think spoon worthy good. In fact, I sent this dish over to my parent’s house for them to try. My mom text me, asking if the green sauce was bad for her because she was literally eating the entire batch out of the bowl…all by herself. This coming from my mom means something is really, really good. She’s very much a pasta and butter kind of girl, so that fact that she loved this really says something. Oh, and my answer to my mom’s question? No the goddess sauce is not bad for you, it’s actually great for you! I packed my goddess sauce full of avocado, yogurt, herbs, and spices. So basically it’s a super food and you should really have it on hand all times. It’s great for making salads, grain bowls, tacos, and everything in between, that much more delicious. What’s amazing about this recipe is that even though it’s loaded with flavor and texture, it’s actually very simple and easy to make. 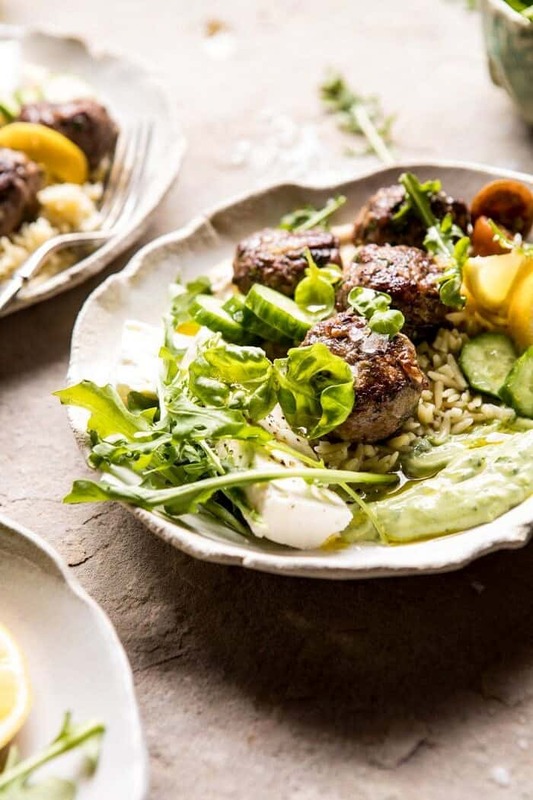 As mentioned, the meatballs are roasted on a baking sheet, while that’s happening you should be preparing your orzo (quinoa and couscous work great too!) and making your goddess sauce. By the time the meatballs are done cooking, everything else should be ready and all you need to do is assemble. Simple, quick, light, healthy, delicious, and pretty much the most perfect weeknight dinner. I feel like I just wrote through this post at a million miles a minute. Currently I am in GO mode, which I love, and which is the perfect way to start a Monday. I’m still on a major high from the weekend. I did an Instagram live and made my Earl Grey Blueberry Muffins from the cookbook. It was SO much fun and I Ioved getting to interact with you all, answers questions, and bake together. Best way to spend my Saturday! Excited to do more live cooking with you guys, so leave your requests in the comments, or email me! Feeling motivated and energized for the week! OK. OKAY. And very excited to remake this recipe again tonight for dinner because I truly cannot get enough. What's amazing about this recipe is that even though it's loaded with flavor and texture, it's actually very simple and easy to make. Simple, quick, light, healthy, delicious, and pretty much the most perfect weeknight dinner. 1. Preheat the oven to 425 degrees F. Line a baking sheet with parchment. 2. Add the lamb, onion, garlic, lemon zest, parsley, cumin, oregano, cayenne, and a pinch each of salt and pepper to a bowl. 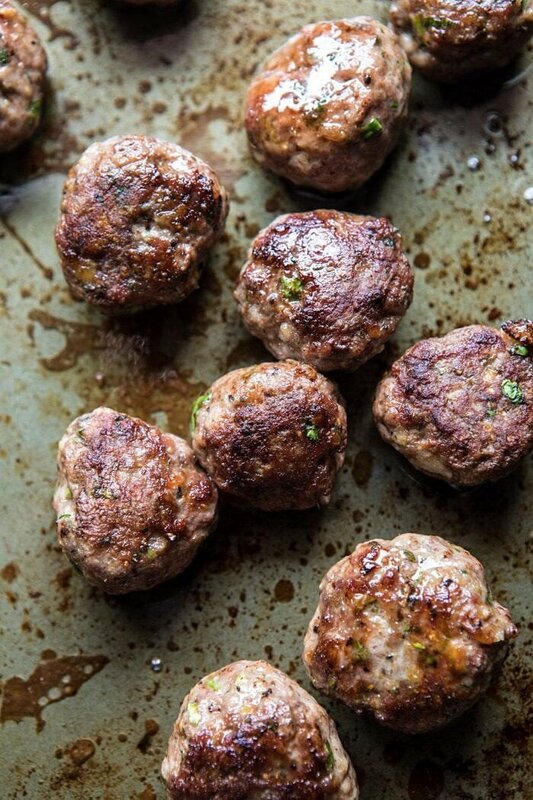 Coat your hands with a bit of olive oil, and roll the meat into 2 tablespoon size balls (will make 10-12 meatballs), placing them on the prepared baking sheet. Transfer to the oven and bake for 15-20 minutes or until the meatballs are crisp or cooked through on the inside. 3. Meanwhile, make the goddess sauce. Combine all ingredients in a blender and blend until smooth and creamy, adding water, 1 tablespoon at a time as needed, to thin the sauce. 4. To serve, spread the hummus and goddess sauce on plates. Add the orzo, meatballs, feta, cucumber, tomatoes, and greens. Drizzle olive oil and lemon juice lightly over top of everything. Enjoy! Good Morning! I’m sure you mean 1 teaspoon dried oregano, not “fried” oregano! LOL! Lol yes! Thank you for catching that! Well, I’m with you on the meatball — that’s why I call them polpette and if they are huge — polpettone. Problem solved! The Greek version sounds wonderful! I love meatballs, it’s been years since I last had lamb meatballs!! all the cravings now! I’m just starting to come around to meatballs myself. I think it’s always been a texture thing as I’m not a big fan of ground meat but there are so many non traditional recipes around now. I find that if I make the meatballs smaller so they are more appealing to me. Will definitely have to give this recipe a go! 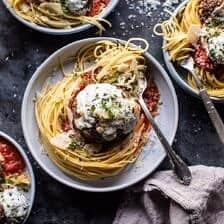 Generally I avoid any recipe that says meatball because while I’m not a vegetarian anymore, I was for ten years and there’s something about that word that makes me shiver! I’m on the same page. But I will NEVER pass up one of your Greek recipes. They are my favorite! I love all the flavors here and love the orzo! I recently saw a recipe for skillet popped lentils- kind of like when you roast a garbanzo bean- if you have any ideas for what to do with them (awesome salad?? )- I’m ready! Also I’m not into mint juleps but mint iced coffee sounds good! Thanks for always hearing my ideas! Keep up the great work! Hahaha! Meatballs. I actually love the word, so much that we used to call our daughter our little meatball when she was a chubby little baby. Meat spheres? No. Recipe looks great, and one I can slightly modify for whole 30.YAY! Thank you Dana!! I hope you love this! This looks delicious! I noticed it doesn’t include any binders to keep it together – shouldn’t an egg be included in the recipe? I just want to say I am very impressed with your talent and creativity at such a young age. 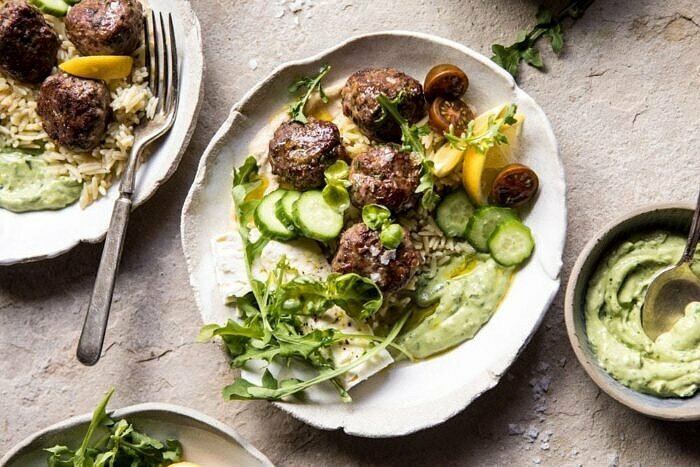 Can’t wait to try the lamb meatballs, looks so good. Loved your live instragram. You did a great job! Keep it coming, always looking for new ideas for my dinners and breakfast too! These look so good! I’ve actually never made my own meatballs, this may change that! Yum! This is my kind of dinner! Hi Tieghan, I have followed you since the early days of your blog and am amazed at what you can do. You are a similar age to my now adult sons and I often feel (weirdly) proud of you. You have come such a long way with your work, especially your photography. I love what an example of a strong, supportive,loving family your blog shows. I tell my uninterested family about you and your families achievements. I have made them watch the snowboarding clips I cared who won the snowboarding at the Olympics and wasn’t hoping for Australia! Regarding the lemon criticism. Nearly everything savoury is better with lemon juice and zest sprinkled just before serving. Also. Chopped parsley. Why is it not served on the table automatically like pepper and salt ? Maybe you could start a trend? Sliced lemons, lemon zest and chopped parsley in the centre of the table, for every roast chicken, grilled steak, lamb or Mediterranean dish served. Congratulations on all you have accomplished and I’m excited to see your future. Oh and I love your recipes and presentation too! Hi Cathy! This is so sweet and amazing to hear, thank you! I hope you continue to love my recipes and blog! Lamb is one of my very favorite meats. But I do agree, the word meatball is quite odd and sounds distasteful. But I think you redeem it with this recipe, especially with the avocado goddess sauce. Wow! Looking forward to trying it. shalom. so many of your recipes sound great, but for those of us who are jewish, mixing meat and diary is an insurmountable obstacle. do you have any ideas/suggestions about what to use instead of dairy? I second Karen’s comment! You always have so many great ideas.Thank you so much for making my meal planning easier. I made this for supper tonight. 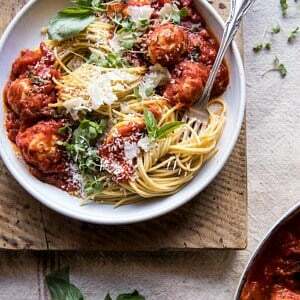 My husband couldn’t stop eating the meatballs and we both agreed it’s a company-worthy meal. We both give this recipe five stars. Awh thank you Carolynn! I am so glad you love my recipes! Made the meatballs and sauce yesterday for a personal chef client and it was very good! However, I added an egg and panko as I was afraid the meatballs would be dense. Also added garlic to the sauce. Sounds so amazing! Thank you Carol! Greek flavors are the best! These look so delicious! Absolutely amazing! I just made this meal for my husband for our 9th wedding anniversary. His family heritage is Greek. He was so happy and amazed. Thank you for much for the awesome food inspiration and wonderful blog! That is so great to hear! I am so glad you both loved this Laura! OH MY GOSH THIS WAS SO GOOD!!! I was surprised at how fast it all came together. As I was bringing it to the table, I said to my husband, I hope you like this, because I’m making it again soon. He LOVED it. So happy to hear that!! Thank you so much Kimberly! Made them with chicken. My husband loved them. I am so glad! Thank you Beth! This was absolutely wonderful❤️Thank you! We were visiting friends from the Netherlands and they made a Dutch meal including meatballs. She didn’t know the American translation and called them “flesh balls.” Worse than meatballs. Much worse. Oh wow! Ya that definitely does not sound appetizing, but makes for a funny story! Thank you Kym! At the risk of sounding like I’m speaking in hyperbole (which I’m not! ), I have pretty much come to expect that I am going to absolutely LOVE any new recipe I try of yours! And oh my word did you deliver on this recipe! I love the textures, the layers and complexity of flavors, and how healthy it is…and the fact that it’s sooooo simple to make is the cherry on top. Thank you so much for this fantastic recipe!! Thank you! I am so glad you enjoyed this Jeannine! I made the meatballs and goddess sauce this week. It was great. Thanks for sharing. Forgot to take pictures. That is so amazing! Thank you Andrea! I cannot wait to get home from work today, because I’m going to spend the evening sipping wine and making THIS. (Not so much wine that I’m not capable of handling the cooking…just enough.) 😉 I’m already hungry but am holding off until I have this awesomeness on my plate! I ordered your cookbook today! It arrives Monday, and I can’t wait to have it as my new “kitchen bible”! Sounds so amazing! I hope you love this recipe and have a great night Aline! And please let me know what you make from the book! I hope you love that as well! Looks great! I enjoy trying different kinds of meatballs, not just beef. Turkey meatballs are pretty good too if they’re seasoned properly. I am glad you like this! Thank you Nick! I just made these! Thank you for sharing your recipe. Delicious. Very flavorful and easy to make. Making the dressing tomorrow because my cilantro was wilted. I actually Googled lamb meatballs to make myself after having some at a local chain Roti. These were perfect. I will definitely be saving and making again. Hi Ayanna! I am so happy you loved these! Thank you so much! I hope you continue to enjoy other recipes on my blog! Update: The dish was a smashing success and came out amazing. SO. GOO.I made extra goddess dressing and it’s good on…everything! 🙂 It was a great night! Hi Aline! I am so glad you got the book! And yes, please let me know what you make! I hope you love everything! This recipe was amazing and we are now addicted to your site. We have made 5 recipes thus far and all are super yummy. Thanks! I am so happy to hear that! Thank you Joseffa! Just wanted to say I made this dish tonight! It was fabulous! Your mom is right I could have eaten the green goddess sauce alone. So good! I added kalamata olives and radishes since I didn’t have any greens on hand. I cannot wait to make this again. Thanks for sharing! I am so glad you loved this! Thank you Karen! 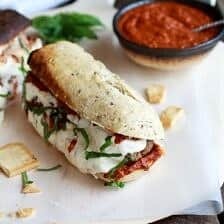 I was planning on making this over the holiday weekend as it looks super light and easy! Quick question though – is the cilantro flavor in the sauce very strong? I don’t like cilantro but am willing to give it a go given that it is blended in the sauce and not served mixed in or fresh on top. I made a double batch 2 nights ago and there were no leftovers. The green goddess sauce is to die for and we used it last night with chicken. I made this for dinner tonight and it turned out fabulously-even better than expected. I did make a few tweaks-I did about 2 tbsp cumin and 3 cloves garlic in the meat, and minced the onion (it just seemed easier for me than grating). I also added 1 clove garlic to the sauce and about twice the yogurt. Served with a fig jam (fig or plum go extremely well with lamb), cucumbers, sliced bell peppers, cherry tomatoes, and warmed whole grain bread. Seriously, love this recipe and I’ll be making it again! Thank you!! I am so happy to hear that! Thank you so much Holly! 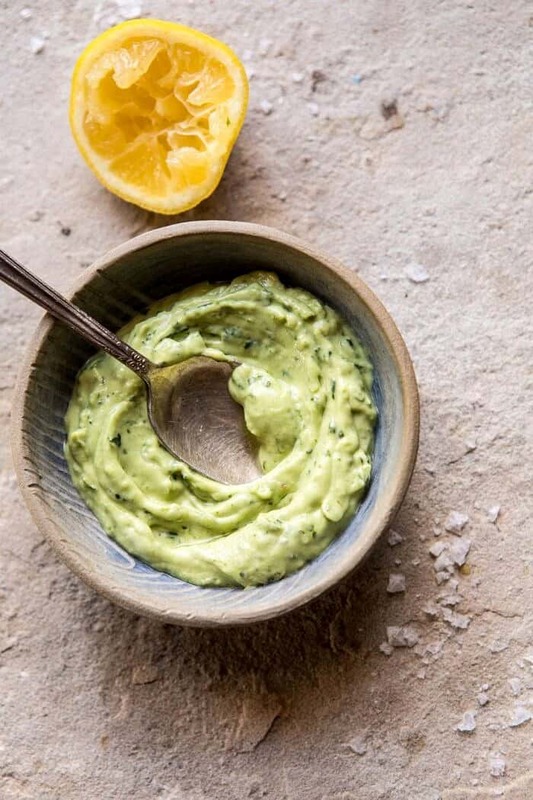 The green sauce is a great alternative to tzatziki, especially when you have a ripe avocado and a bunch of rest basil in the house. Thanks! Thank you Alex! I am so glad this turned out so well for you! This was fantastic! Just made tonight after seeing it was one of your top recipes. Added a jalapeño to the meatballs to make them spicy. Thanks so much!! Hi! This meal was delicious! Great recipe! Quick question, how long does the sauce last in the fridge? Very nice meal. Will make again. Would not change anything. Hi Rachel! I am sorry you did not enjoy this! Are there any questions I could answer for you? Please let me know! This was the first Half Baked Harvest recipe I’ve tried, and after dinner, I immediately went online and ordered your cookbook! Made it with pronghorn instead of lamb, as that was what we had in the freezer 🙂 Sooooooo yummy. I live in Summit County as well, so it’s nice to know we’re both probably shopping at the same less-than-awesome grocery stores, and I won’t run into anything too crazy in your ingredient lists! Can you suggest an alternative protein? My husband doesn’t like lamb. 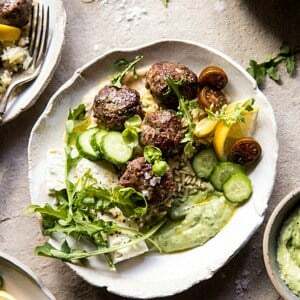 These lamb meat balls are delicious. Didn’t have basil to add. Instead used mint and cilantro. Delicious along with the avo cream. I will make this again. I didn’t make the grain side and didn’t feel I missed it. Salad with cucumbers, radish, onions, cilantro, mint, parsley was an appropriate side. Thank you for the recipe.